In a competition to find the home of the world’s greatest luthiers, Lombardy, Italy might just win the competition. Cremona, that little-know gem of a town in the region was, of course, home to a fellow called Stradivarius. The Violin Museum in the town contains a collection of his work and a fair few works of great guitar luthiers such as Antonio Torres. I was disappointed to find only four Italian guitar makers featured on a website dedicated to gypsy jazz guitar constructors. Italy tends to get overlooked for gypsy jazz - ironic since Mario Maccaferri (Django Reinhardt's guitar maker) was an Italian. 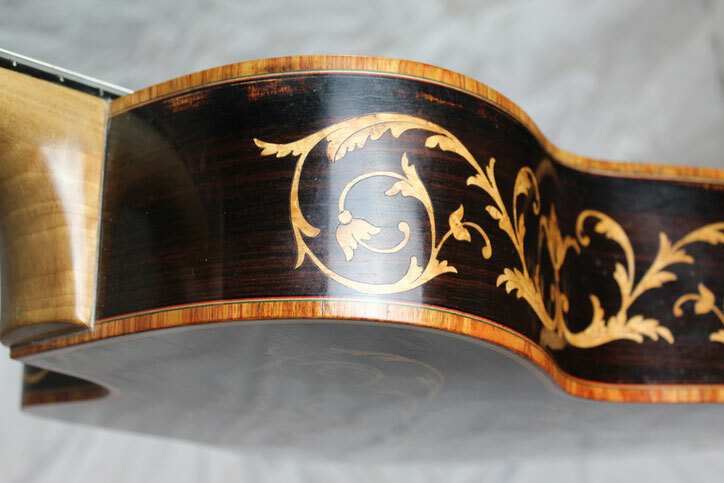 Hidden away in this neck of the woods are some awesome craftsmen who can compete with any of the great French luthiers. 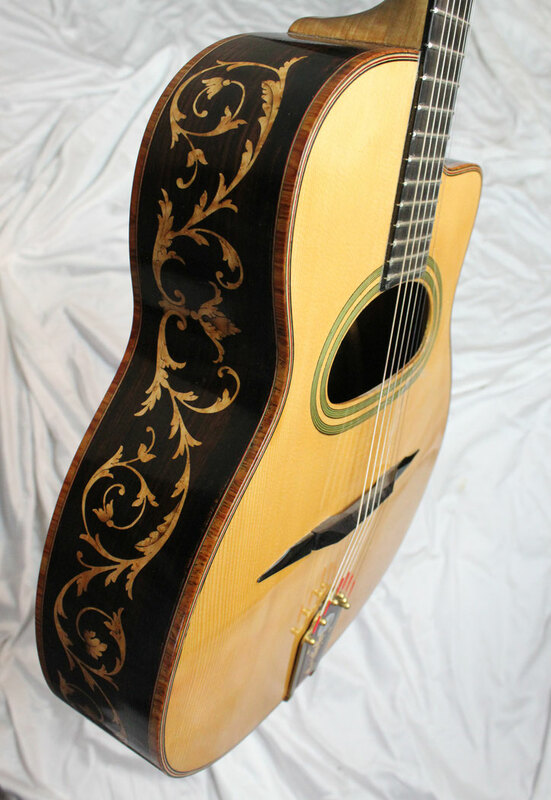 This sublime guitar was constructed by Luigi Bariselli, whose workshop is located on the outskirts of Milan. 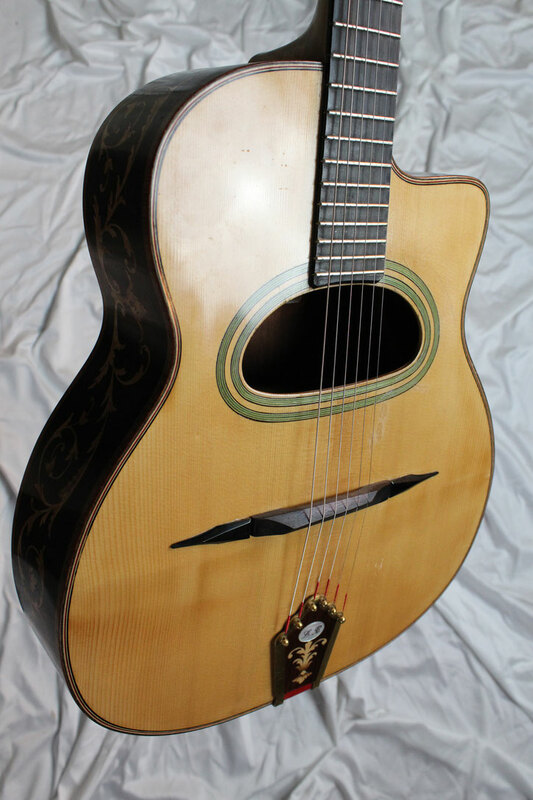 Bariselli built his first gypsy jazz Maccaferri-style guitar using measurements taken from photos. In spite of not having ever got to see an original first-hand, he took a photo of the guitar of Django Reinhardt, multiplied its dimensions by four and built his version of it. 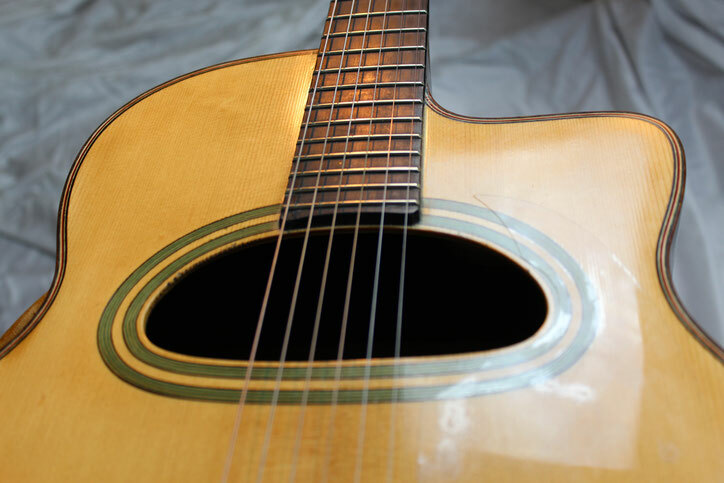 The resulting guitar received highly positive praise from players who claimed he had captured the essence, the ‘voice’ and the bright tone that the genre requires. Some years later Luigi Bariselli managed to get his hands on an original Maccaferri. After a meeting with Maccaferri’s nephew in an instrument fair in Cremona, the relative went to his car and returned with two of his uncle’s original designs. 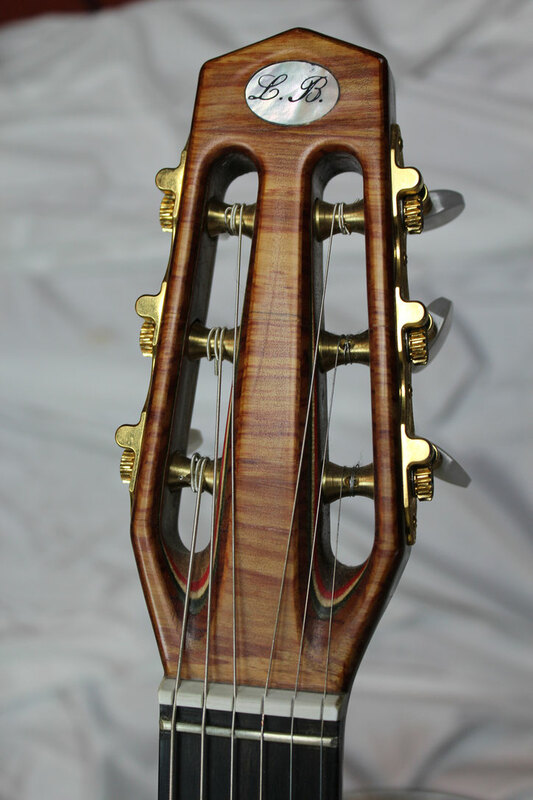 Bariselli immediately set about producing the most faithful rendition of the famous Manouche model. 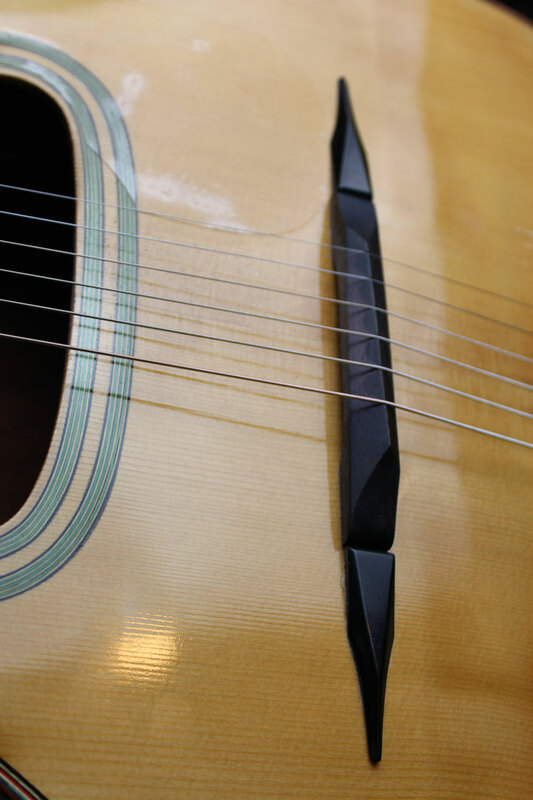 The first discovery was that the face of the guitar wasn't actually flat, but was inclined, sloping off behind the bridge towards the lower bout of the instrument. 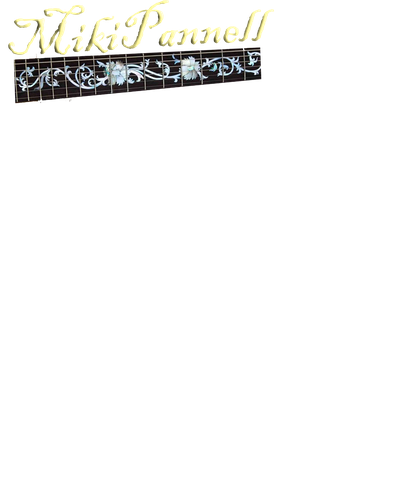 So to the guitar itself. 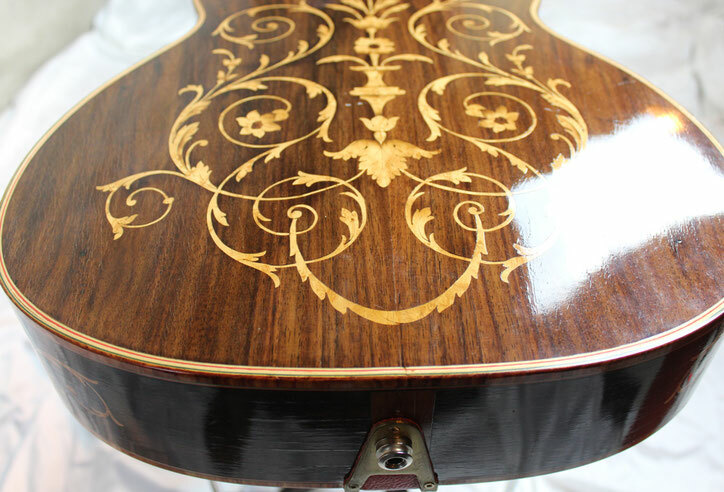 Amongst the various Bariselli Manouche models produced can be found a whole range of unique details. The most spectacular (like this model) contained highly-elaborate inlayed wood designs. Early on. 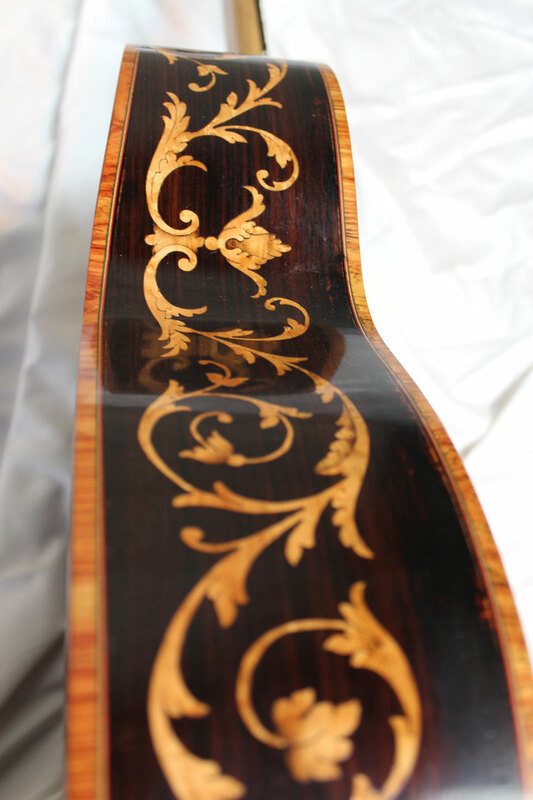 a small 15 cm inlay adorned the back of some models. 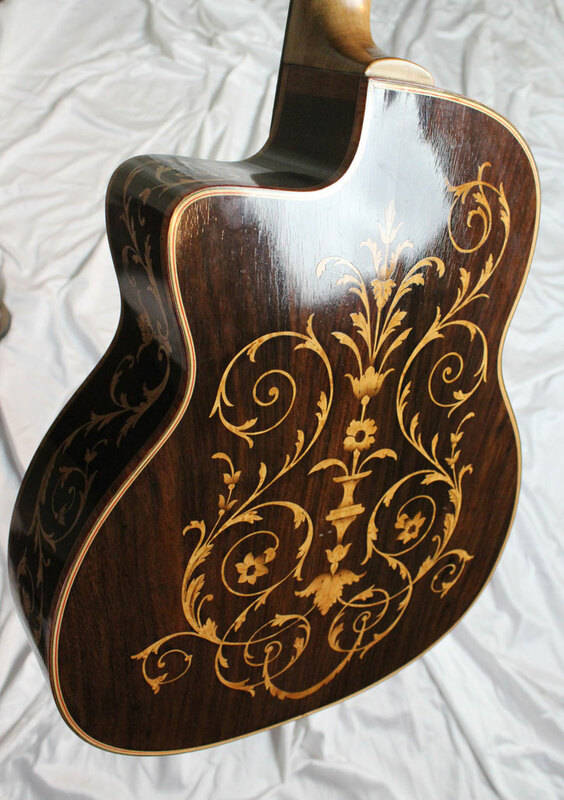 Bariselli later extended the technique to cover the entire back and sides of the guitar. Each one slightly different. No detail was spared. 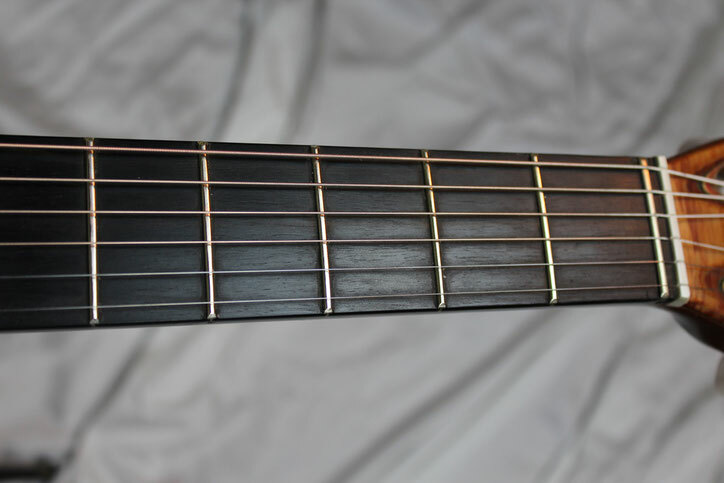 The neck of this model is silky smooth ebony, as is the bridge. 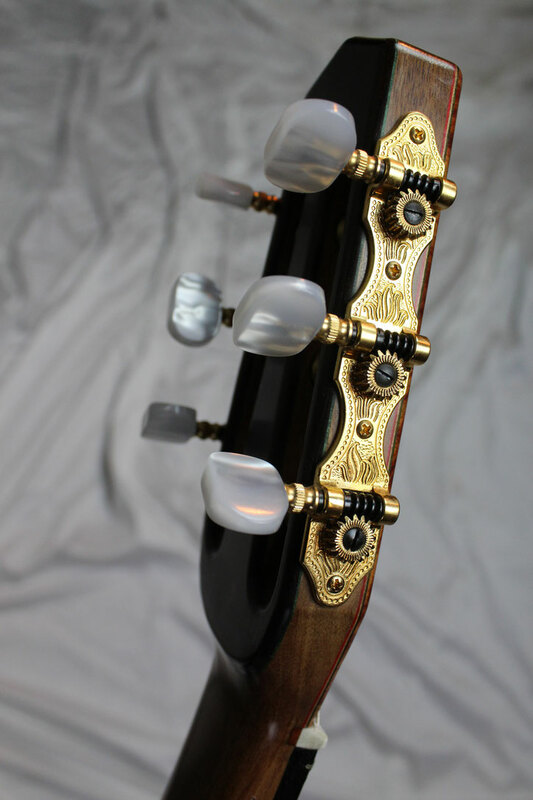 The tigered headstock is gorgeous. 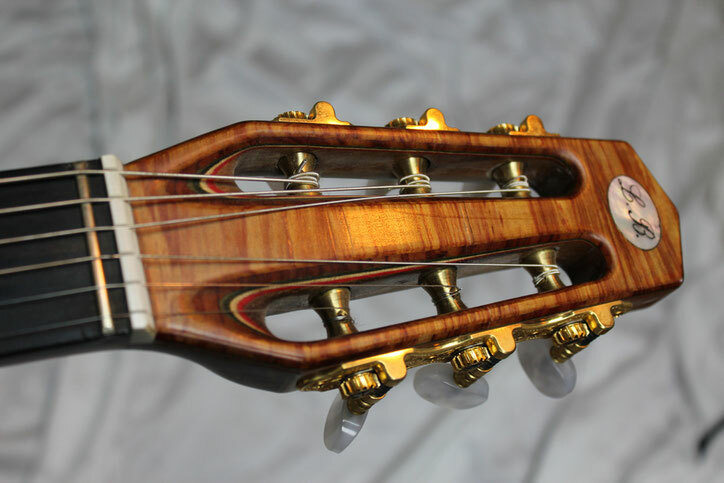 Likewise, the head, featuring the luthier’s initials and the superbly finished string attachment plate (which differed greatly over the years) feature some of Bariselli’s finest work ever. 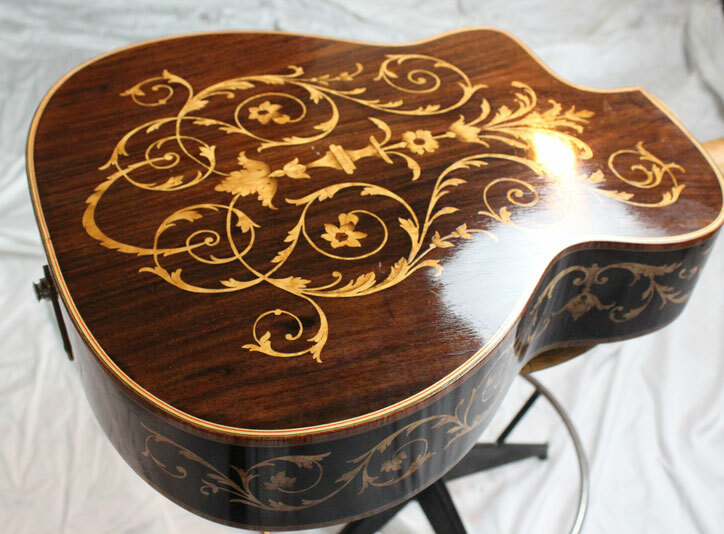 As the guitar is signed 2014, it is one of the most recent from a career spanning more than fifty years. But the real virtue of this dream guitar is the sheer volume and clarity of tone - capable of filling a room, no matter how large. I now understand how Django could play acoustically. The resonance and tonality highlight every nuance of one’s playing. For good or bad! I recently got the pleasure of shooting this guitar out with a beautiful all-maple f-holed Dupont guitar in Varese’s 440 hz shop. There can be no doubt about the quality and balance of a top-level Dupont, after all, they've been played by all the top gypsy jazz guitarist. But the Bariselli I would have to say, was the undisputed winner both aesthetically and sonically. The sound was just huge and more awe-inspiring.